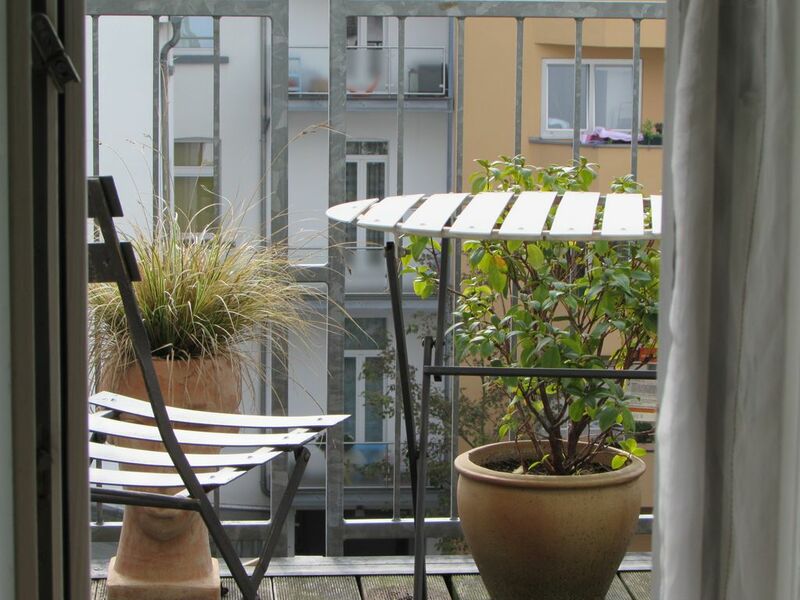 The apartment is located in the heart of Unterbilk, a trendy part of Dusseldorf. Several trendy bars and chic shops on the Lorettostrasse make this district very worth seeing and experiencing. The short distance to the Media Harbour, Königsallee and the old town inviting to explore a walk. The airport and the exhibition is about 10 km away and can be very well served by public transport in a few minutes. The apartment is about 37 square meters, has a south-facing balcony and is located in the third Floor of a building with the flair of style around the turn of the century (no elevator!). The hall is furnished with a large closet and a cloakroom. If necessary, waiting a steam iron and ironing board. The bathroom has a small shower, vanity unit with basin and WC. A window provides ventilation and beautiful natural light. Hairdryer and towels are provided. The apartment is covered with laminate in natural wood look. The cozy kitchen is equipped with sink, ceramic hob with 2 zones, fridge / freezer and microwave with grill and Crisp Function, and of course, a dining table with 2 comfortable chairs. A Senseo coffee machine, kettle, toaster, cookware, dishes, glasses, cutlery and tea towels are provided. The living room / bedroom is furnished with a comfortable pull-out sofa bed (140x200cm / bedding locally) and a chest of drawers, coffee table and an armchair. A 50Zoll plasma televisions with satellite channels and Blu-Ray DVD / CD player provide entertainment. A small selection of DVDs and CDs we have set. On the south-facing balcony we put down to relax and enjoy a small table and 2 chairs. The apartment is furnished for 2 persons and fully designed for self-sufficiency. If necessary. can be used for a third Person will be supplied for an additional fee (20 euros / night) for a guest bed. The apartment is a Non smoking apartment and we would like to keep it that way. Please smoke only and exclusively on the balcony, a small ashtray is available. We have set for our guests information materials about Dusseldorf and environment, but also give you our personal tips and recommendations to you, please contact us! If you arrive by car we point out that we can not provide a parking space. The parking space in the immediate vicinity of the apartment is very limited and mostly chargeable. We therefore strongly recommend that you travel by public transport. Check-in times are generally between 18:00 and 21:00, other times are only possible by prior arrangement. Check-out on departure day until 11:00 clock please. If the renter does not yet have any ratings, we reserve the right to carry out an identity check using suitable documents (driver's license, identity card or similar) before accepting the booking request. Owners are really friendly and helpful. Property is very well supplied with all of the essentials needed for a late evening arrival. A great base for the harbour end of the city and less than 30 minute stroll along the river to the old town. Only downside? 3 flights of stairs to the top floor! I was very satisfied with my decision to rent this apartment because it was conveniently located to all the activities during my stay in Dusseldorf. Also the apartment had all the amenities that I needed during my short stay. I thank Martin and Ingrid for their hospitality. Fabulous place and friendly owners. Really beautiful area in the center of the city. Very beautiful house and interesting apartment. Very good value for money. Thank you very much, Ingrid and Martin! Hope to see you again! Great host. Very very helpful. Good location. Close to tramstation, restaurants and grocery store. The single unconvenience was slow internet connection. Everything else great. Perfect location, quiet charming neighborhood. I had a wonderful stay. Very convenient location with a short walk to the Altstadt. Beautiful historic building with a nice cozy interior. The property owners were great and very inviting, thank you Ingrid and Martin. I would definitely stay again. Der Check-in am Anreisetag ist generell zwischen 18:00 und 21:00 Uhr möglich, nach Absprache auch zu anderen Zeiten. Check-Out am Abreisetag bitte bis 11:00 Uhr.